The sequel to This Is the Police has arrived on PS4. 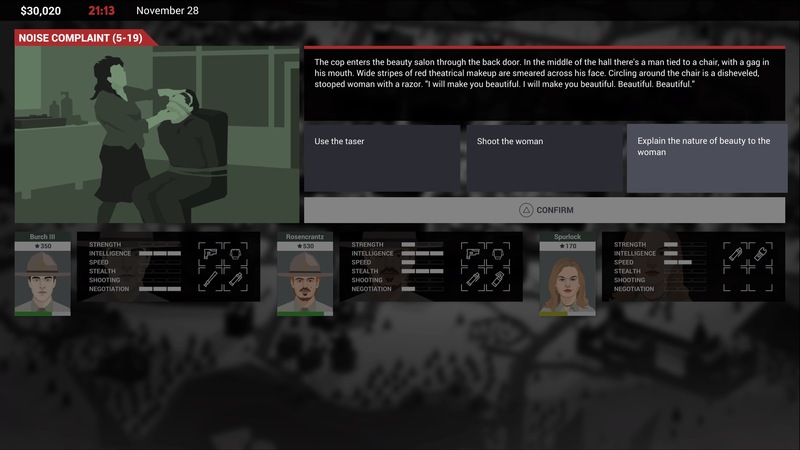 This Is the Police 2 continues the story of Jack Boyd and has similar management gameplay, but most elements have seen substantial improvements. Without spoiling too much of the plot from the first title, Jack finds himself hidden away in the snowy town of Sharpwood. After the cabin he’s renting is caught up in a drugs bust, he is identified by the new, inexperienced Sheriff and is drafted in to help with the crime problem. 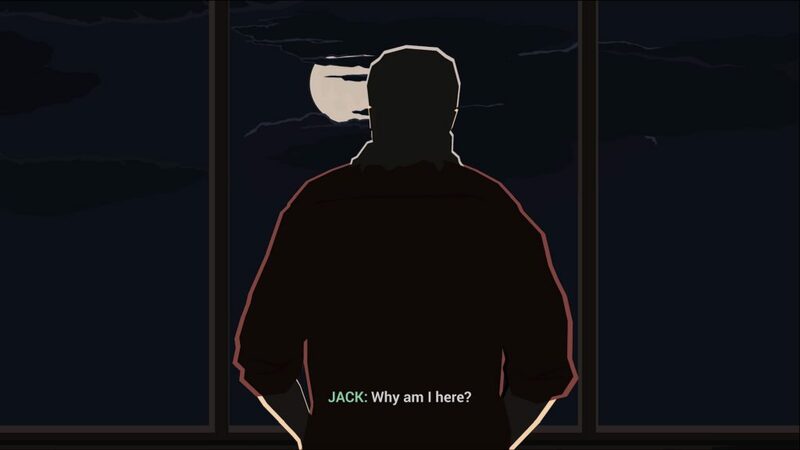 Jack’s past has a way of catching up with him though so staying clean is not going to be an option and balancing fighting crime and keeping less savoury characters off your back is a challenge. As with the first game being in charge of the officers means you tell them exactly what to do at all times. You get to choose who works each day from your roster, employing more at the end of the day with currency you earn from catching criminals. 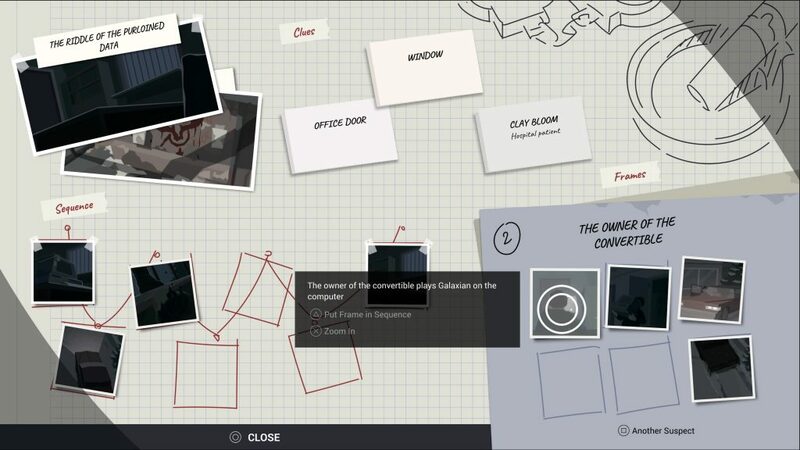 From here you get a map of the town and crimes will appear on the left of the screen for you to assign people to. Each has a time limit so you’ll want to attend to each as soon as possible, bringing up each will give you a little explanation of what has been called in. From here you need to send cops whose professionalism, denoted by a number next to a star, adds up to or above the required number. This could mean one of your better cops or multiple lesser ones. Cops have respect for you, or not, so some will ignore certain orders or will refuse to work alone. This respect can go up or down and your life will be easier with a roster of loyal cops. Officers will also have their own quirks, like a man that refuses to work with women or a female officer who will not work with a man less professional than she is. Added for the sequel are stats. Each officer has a range of stats that they come with and can be upgraded as their professionalism increases. Strength, intelligence, speed, stealth, shooting and negotiation are the stats and they come into play when the cops reach the crime scene. Unlike the simple choose your own adventure style randomness of the first game here the options you have can succeed or fail depending on the officer performing them. Trying to chase down a suspect with a slow cop will fail, whilst trying to talk someone down with a great negotiator will always work out. Similarly you assign equipment to your officers so someone with a baton or taser might get the option to take down someone non-lethally. Everyone has a knife and gun which, generally, should be used as a last resort. There will be larger crimes that require your input to determine a suspect. 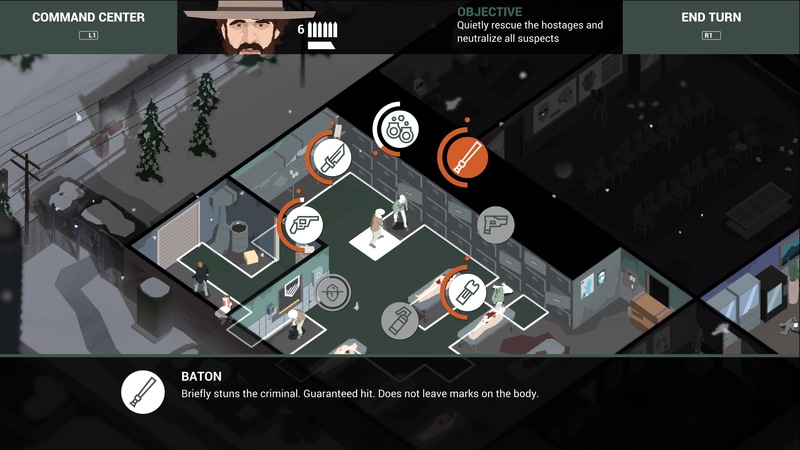 Unlike the first game where you had detectives, here you simply use some of your officers to collect clues and information, though when they’re doing that they won’t be available on the streets. The higher their intelligence stat the better and once you’ve got enough evidence you can arrange a story board, of sorts, of what happened and send your officers to catch whoever you figure to be guilty. Another improvement from the first game here is that the images you arrange are now annotated, so no more having to decipher what the images mean before trying to arrange them into order. There is an additional game mode added to This Is the Police 2. Certain crimes lead to tactical missions, which means you get to control your officers in an XCOM style. As is the norm for these things you, by default, have two actions which you can use to either move twice or move and act or act and then move or act twice. The officers stats will allow them to activate perks before they start the missions which will let them diffuse traps, silently unlock doors or windows or climb over walls, to name a few. Enemies move in set patterns and generally you’ll want to stay silent and stun then arrest suspects rather than opening fire but if a gun fight does start then you have high and low cover as is standard and your officers can get injured or even die. Fail the entire mission and the game will offer you a chance to try again, which is nice and forgiving. Despite all these changes, which are for the better, the flow of the game is very similar to the first. Get a cutscene, complete a day sending your officers around, maybe a tactical battle, get another cutscene possibly, start a new day and so on. I did feel the game flowed better, with the strategy side of things benefiting massively from the extra control with your officer’s stats and the whole thing moving at a smoother pace all round. Depending on what happens a day can take quite a while, but I still found it felt less repetitive. Unfortunately the game was literally repetitive for me as I had the game crash after almost every day. As there is no manual save and the game only autosaves at the beginning of a new day the game would crash at the worst possible moment. This would mean loading up the game and playing through the same day again and with the slight randomness to the events a perfect performance before the crash could be less perfect after the crash, although the opposite is also true. Turning off the game after each save seems to help. I also got a bug where the day had ended and I was just waiting for my final officer to return to the station and he never came, so I was sat on the town screen with nothing happening, never to finish the day forcing another repeat. Hopefully this can be patched as the game’s pacing may be better than the first, but that is completely ruined by the performance. Beyond the gameplay the story is a huge priority, much like the first game. Cutscenes can be long and frequent, but thankfully the plot and voice acting are strong. Jack Boyd is difficult to like but that’s kind of the point, as he takes control of the department and does what he can to survive. Cutscenes play out using panels like a graphic novel, sometimes with a dash of animation every now and then, combining with the art style to give a rota scoped effect like Flashback. This Is the Police 2 improves a lot from the first game in most areas. Your officer’s stats add an element of control that was missing from the first game, it feels like it drags less and the tactical missions are an interesting distraction from the normal gameplay. It still has the same routine as the original so if you enjoyed the first game or not in that respect then that will still be the case here. Crashes marred my experience unfortunately, forcing me to repeat most days twice if I wanted to progress. Hopefully a patch will be swift as I do believe overall This Is the Police 2 is an improvement and the score would reflect that, but although you can force your way through the crashes it makes what can be a repetitive game anyway incredibly so. This Is the Police 2 takes the first game and develops certain aspects whilst adding tactical battles to break up the daily routine. The story and presentation are strong but it falls into a similar gameplay loop to the first game, for better or worse.